Incredible as it may seem, simply talking about & sharing Margot’s story is saving the lives of blood cancer patients all over the world. And whilst we don’t get to hear about most of these donations, it’s comforting to know that someone donates stem cells every week and potentially saves a life because of you, Team Margot. Stem cell / bone marrow transplants are usually the only chance of survival for blood cancer patients, so it’s a fitting legacy for my daughter, Margot that the work of Team Margot affords hundreds of people a second chance at life. Ultimately, this is only possible because of the individual donor, who not only thought to register, but then followed through with their pledge to donate, after being matched with a patient in need. 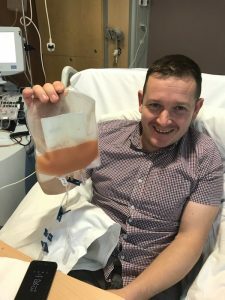 Today, to mark World Marrow Donor Day, I wanted to share the circumstances leading up to one such donation. I’m not so much wishing to single out the specific donor, Rob Rowe (in spite of him being an absolute hero), but instead, by highlighting the decisions & positive actions Rob and many others like him have taken, I also wish to underscore the decisions & actions of all donors and indeed all those heroic people who have signed up to the register to go on standby to save a life. So by thanking Rob I also want to THANK YOU ALL ! 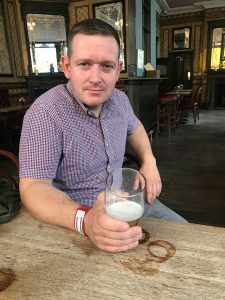 Rob’s donation arose because of his link to his football team, which is called Wednesbury Athletic. By way of introduction, Wednesbury Athletic is based in the Midlands and is probably the best football team in the world. 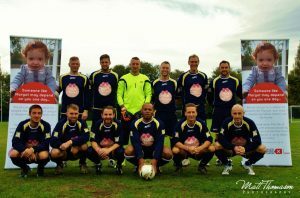 The players and indeed the entire club have always been a part of Team Margot, supporting right from the outset when family and friends first came together as ‘Team Margot’ in 2014. This has happened primarily because of their Manager, Gav Ingles. 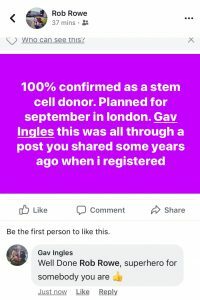 Gav has been the reason for many of the club members & players registering as potential stem cell donors and the team kit has proudly sported the Team Margot logo for years. 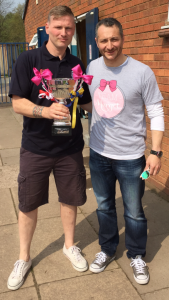 Furthermore, Gav has organised exhibition football matches for Wednesbury Athletic over the years against ‘Legend Teams’ made up of former football superstars; the teams have competed against one another for The Margot Martini Cup. All this activity has helped spread awareness and encourage action, keeping Team Margot at the forefront of people’s minds. But it was a Facebook post that Gav wrote which first caught Rob’s eye. 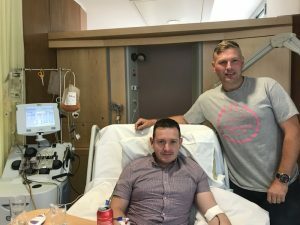 It resulted in him becoming a potential stem cell donor, something which he promptly forgot about, until he was contacted by the donor centre, DKMS. Rob’s donation occurred some time later. As I say, Rob isn’t alone. Many tens of thousands of you have similarly registered and are on ‘standby to save a life’. On average there’s a ‘1 in 1,200’ chance of you being asked to actually donate. 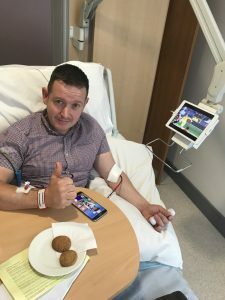 We love hearing about people donating their stem cells – it’s wonderfully uplifting. Please tell us about your own experiences. It’s even more special when people tell us that they joined the register because of Margot’s story. Thank you donor ! (again) and like Rob, please continue to encourage ‘Just One More‘ to do the same. 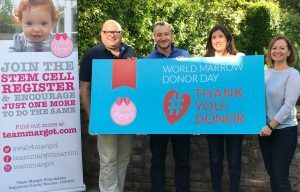 World Marrow Donor Day (WMDD) is celebrated globally on the third Saturday of September. In 2018 WMDD will be held on Saturday, September 15, 2018. The day will be celebrated in more than 50 countries around the world reaching hundreds of thousands of people and resulting in a great deal of media coverage. The campaign, which originally was held as a European event in Italy, Spain, France and Belgium, was expanded by the WMDA to a worldwide celebration in 2015. The main objective of WMDD is to thank all donors worldwide. Unrelated donors, family donors, cord blood donors, donors who already have donated, and donors who are on the global registry waiting to donate. Secondary objective is to raise awareness among the general public and decision-makers about being a stem cell donor and the impact of blood stem cell transplantation on patients’ lives. For many children and adults in need of a transplant we are unable to find a match within the global registry of 30 million donors and therefore, more potential volunteer donors need to be recruited. This is especially true for patients with mixed race or from ethnic minorities. WMDD targets primarily the general public, but also seeks to raise awareness among policymakers, public authorities, industry representatives, researchers, health professionals and anyone who has a genuine interest in blood stem cell donation and blood stem cell transplantation.  This website includes information about WMDD events happening around the world, how to register an event and submit international donor/recipient stories.